•Site in Unincorporated Palm Beach County. •Corner lot & highly visible site. •Located on Lantana Road between Lawrence Road and Congress Avenue, west of Interstate 95. 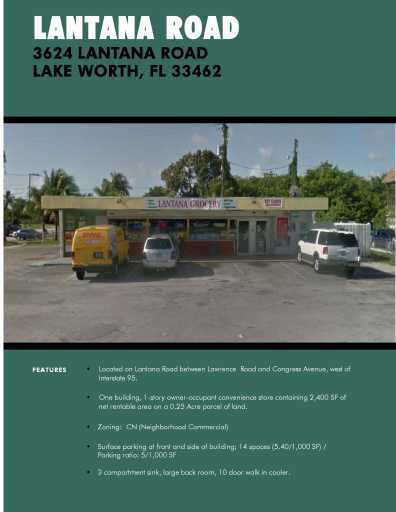 •One building, 1-story owner-occupant convenience store containing 2,400SF of net rentable area on a 0.25Acre parcel ofland. •3 compartment sink, large back room, 10 door walk in cooler.